It has been nearly a month since the end of the 2017 Legislative Session, and we have been very busy continuing to work on your behalf! Since the end of session, we have signed 550 bills into law, including many of our administration’s top priorities. From the More Jobs for Marylanders Act to our entire 2017 Environmental Agenda, the 2017 legislative session was a win for Marylanders across the state. In addition, wiith the repeal of the Road Kill Bill, we are now moving forward on many of the top priority road projects. 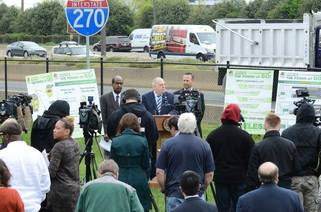 We announced the winning design-build team that will transform I-270 from Frederick County to Montgomery County. Read on below to learn more about this innovative project that will reduce congestion on this important roadway. This month was not without its personal trials. 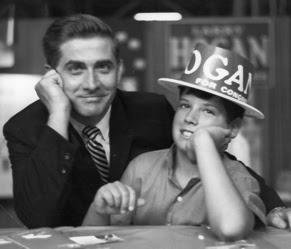 My father, Larry Hogan Sr., suffered a major stroke and later passed away. I am incredibly grateful for the support our family received during this difficult time. Our administration looks forward to all that May has to offer, and we are excited to continue to Change Maryland for the Better. Celebrating the Life, Loving Memory, and Lasting Legacy of Larry Hogan Sr.
“At 10:24 PM on April 20, 2017, an American hero, and the man that I am most proud of, passed away. My dad had an amazing life that spanned 88 years. He left behind a loving family, countless friends and admirers, and a lasting legacy that won’t be forgotten. He was a man in the arena. He knew victory and defeat. He stood up and fought, even when the odds were stacked against him, and he never gave up fighting right until the very end. He spent his entire life, fighting valiantly for the things he believed in. That, I believe, will forever be his legacy. 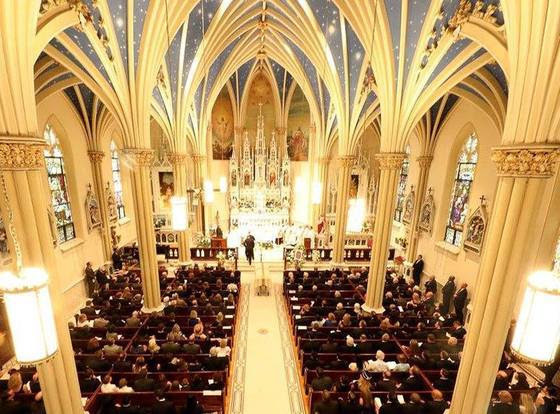 Hundreds gather in St. Mary’s Catholic Church in Annapolis to celebrate the life of Larry Hogan Sr. 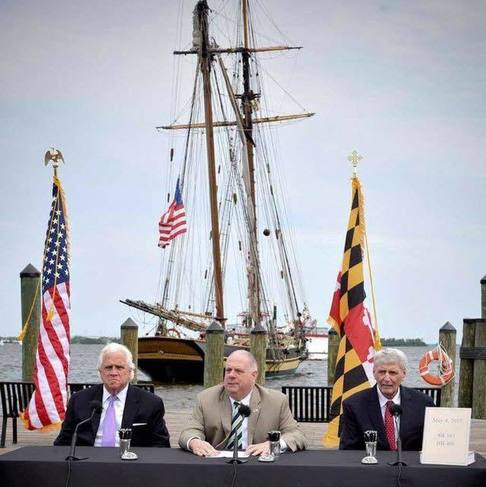 Governor Larry Hogan, along with Senate President Thomas V. “Mike” Miller and Speaker of the House Mike Busch, signed 207 bills into law, including the Clean Cars Act of 2017, the Clean Water Commerce Act of 2017, and legislation establishing the Maryland Energy Innovation Institute. These bills comprised the governor’s 2017 environmental agenda, designed to improve water and air quality, promote the use of electric vehicles, and attract and develop private clean energy innovations in Maryland. These legislative initiatives build on the Hogan administration’s strong commitment to protecting and improving Maryland’s environment, which has included over $3 billion for in funding for Chesapeake Bay restoration efforts since taking office. To learn more about the bills signed at the ceremony, visit bit.do/EnvironmentBillSigning. Governor Hogan speaks about the importance of the administration’s 2017 Environmental Agenda. Governor Larry Hogan announced advancement of the state’s $100 million I-270 Innovative Congestion Management Project, which will save drivers up to 30 minutes on their morning commute southbound from Frederick to I-495. The winning design-build team, comprised of 16 firms, was selected following a competitive bidding process to deliver a modern adaptable highway by creating an automated smart traffic system that will move the most vehicles fastest and farthest on I-270 between I-70 and I-495. Learn more about the project by going to bit.do/MDI-270Project. 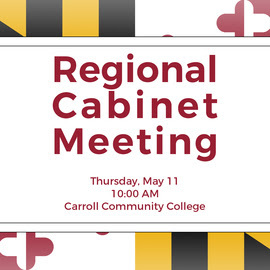 On Thursday, May 11, the Hogan administration will bring state government directly to Carroll County by hosting the second Regional Cabinet Meeting at Carroll Community College. For more details, visit bit.do/CarrollCabinet. Manufacturing Support Industries, Inc. (MSI) a manufacturer of precision components for the defense industry, is expanding its operations in Salisbury. As part of a strategic affiliation with Craig Technologies in Seaford, Del., product lines are being integrated at MSI’s Salisbury facility, which will add 42 new jobs over the next three years. Since 1998, MSI has manufactured high-precision weaponry components for the military. The company provides services from initial fabrication to final assembly and testing. This is the third major manufacturing project for Salisbury in the past six months. 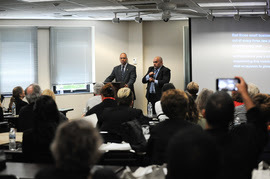 The Governor’s Office of the Deaf and Hard of Hearing today hosted the nation’s first Deaf Business Summit: “Deaf Ecosystem: Maryland’s Open for Business.” It was the first time that a governor has hosted an event exclusively for Deaf and hard of hearing business owners, supporting and encouraging entrepreneurship among the Deaf and hard of hearing business community. 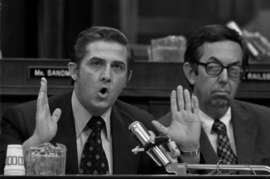 Larry Hogan Sr. was the only Republican member of Congress who voted in favor of all three Articles of Impeachment during President Richard Nixon’s impeachment proceedings. Watch Congressman Hogan’s testimony during the House Judiciary Committee Hearing.